An activity everyone will need and appreciate on Easter. 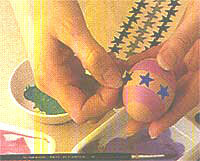 How to design and decorate eggs for Easter. Well, we have given all the instructions below. 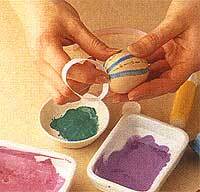 Follow the simple steps, and soon you will have a collection of colorful Easter eggs for your decorations. 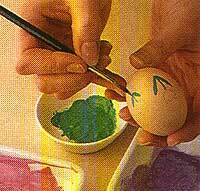 Painting eggs for Easter is funny. And at the same time crafty too! A little flaw, and the whole thing turns a mess. Handle them with care, and the prize is worth it. Impress your loved ones with the with the loveliest Easter gift: a basket full of decorated eggs. Given here is a little basket of blown eggs decorated with paint, ribbon and stuck-on shapes- even sequins. Try them out . They are not just charming. Done all by yourself, they are cute, nifty, and permanent! 1. Wash the eggs in cold water and dry on paper towels. Use a sharp-pointed pin to screw a small hole in each end of an egg. 2. 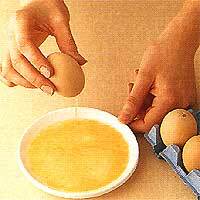 Shake the egg vigorously to break the yolk and mix it with the white. Then hold the egg over a saucer and blow hard into one hole until all the contents have run out of the other hole. Wash the shell carefully under cold running water, rinsing out several times. Then leave it to dry. Repeat the process with other eggs. 3. Use a soft pencil to mark a design lightly on each shell. 4. Paint motifs. Decide before hand the design and the color to be applied. Then use one color at a time to draw the motifs. 5. 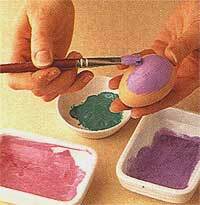 Paint some eggs one color all over. Just for a break. 6. Stick a loop of silk ribbon on the top of an egg for hanging. 7. 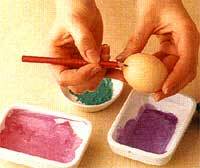 For designing striped eggs indicate lightly the areas of different color in pencil. 8. Put colors in the stripes using the penciled lines as a guide. 9. 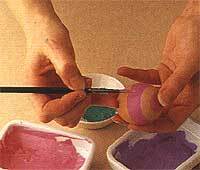 Decorate plain painted eggs with bands of ribbon and bows. 10. Stick on the sticker stars to make a pattern with the painted stripes.